Hemp protein is usually not a pure protein supplement, as it is made up of 10% fatty acids (omega-3s and omega-6s) and confers a high inherent fiber content. Hemp protein is not considered to be a complete protein source, due to being low in the amino acid Lysine (one of the main building blocks of protein); its also relatively low in Leucine, but it does contain a high amount of Arginine, and L-Tyrosine. Hemp protein has a ton of micro nutrients too. Full of antioxidants and essential minerals such as zinc, magnesium, iron, and potassium. High in fiber, potassium, magnesium, iron, and zinc. May help regulate blood pressure. Has antioxidant minerals and immune boosting properties. Hemp protein is a great alternative to whey or milk based protein powders. Those who have a dairy allergy or sensitivity usually go with a plant based protein powder such has hemp protein. Vegans or vegetarians who choose to take a hemp based protein powder should make sure their diet includes beans, nuts, and lentils to ensure adequate intake of lysine. All 10 hemp protein powder supplements reviewed in this batch passed ingredient quality standards. All products were made from organic, non-gmo sources. Plant based protein powders tend to be far healthier when it comes to ingredient quality and nutritional profiles. Onlinestrength’s ingredient value rankings are largely based on ingredient sources, with added artificial flavoring, fillers, and sweeteners being penalized in this rating. Most hemp proteins fared very well with basically all products having no unnecessary or harmful ingredients. There is good scientific evidence suggesting that adding more protein into your diet is effective at improving lean muscle mass and body composition as well as supporting overall health. Hemp protein is lactose, vegan, and vegetarian friendly making it easier for individuals who suffer from lactose or allergies to be able to supplement more protein into their diet. Omega fatty acids in hemp protein have been shown to improve cognition and cardiovascular health. Hemp protein contains Arginine, an amino acid responsible for improving cardiovascular health and boosting nitric oxide levels in the body. Overall, hemp protein powders supplements had relatively zero filler ingredients. All products contained a very high quality source of organic hemp. Products that contained organic, non-gmo hemp ranked higher in the list. Products that did include a sweetener used organic stevia plant. 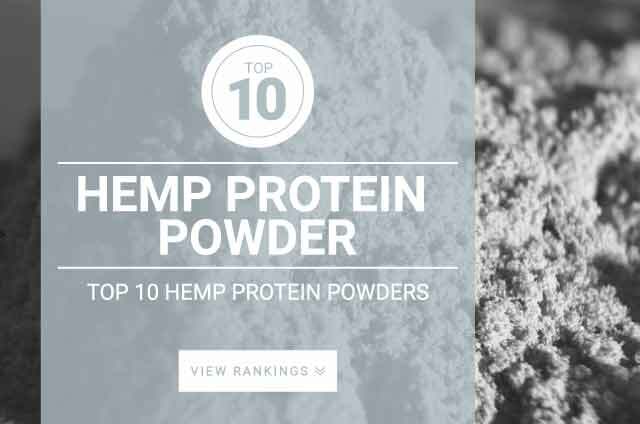 Many athletes, vegans, and vegetarians choose to take hemp protein powder because of its holsitic health benefits as most hemp proteins are made without the use of high heats and chemicals. Its also a great choice for raw vegans and raw vegetarians who are on a raw food diet. A typical serving of hemp protein powder is 1 scoop (about 30 grams) which is about 15 grams of protein per serving. Most people will add 1 serving of hemp protein powder into their daily diet but some take as many as five or more per day, depending on the desired protein intake they are trying to reach.